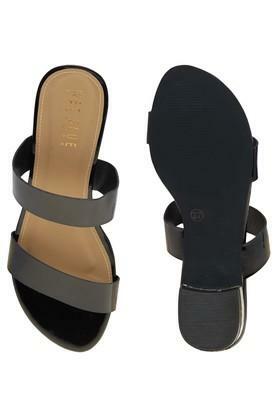 Impeccably designed, this pair of flat sandals from Wet Blue will help you upgrade your footwear collection. The fine quality patent leather that has been used in the making of its upper part gives it an elegant finish. Moreover, it has a slip on style that makes it convenient to wear. The round toe further accentuates its design. Carry a chic look by wearing this pair of flat sandals for any casual occasion. You can team it with a printed dress and simple accessories to make a style statement.